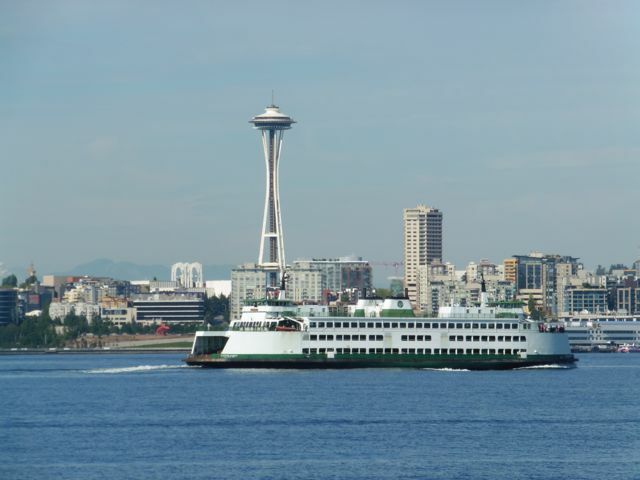 West Seattle’s Alki Peninsula sticks out into Puget Sound like a thumb, and offers the best views east to the Seattle skyline including the Space Needle and the waterfront districts from the cruise ship terminals to the shipyards. 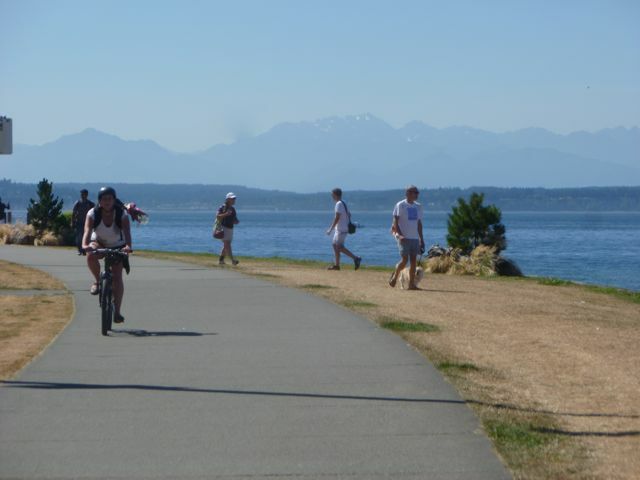 The Alki Trail follows the shoreline of the peninsula providing the best views Seattle has to offer, from Mount Rainier, to Seattle, the Olympic Mountains and Puget Sound islands, and then Mount Rainier again. The main part of the perfectly flat trail is only 3 miles long each way, most of which has separate paths for bikes and peds. Dining choices abound, from the famous Salty’s, to a dining district with numerous water-view restaurants of all types. 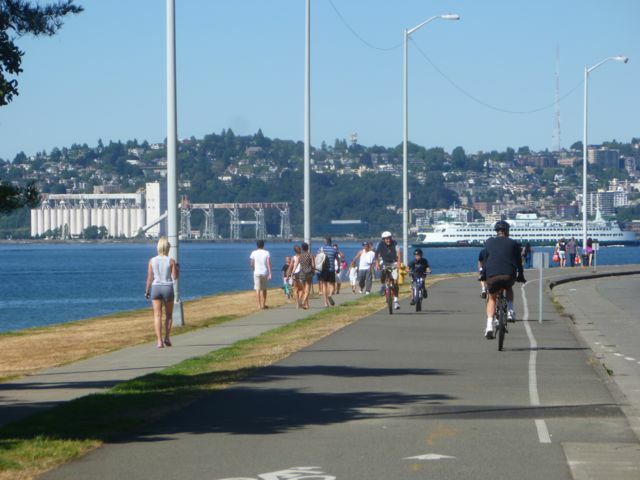 Alki Beach is one of the city’s most popular. 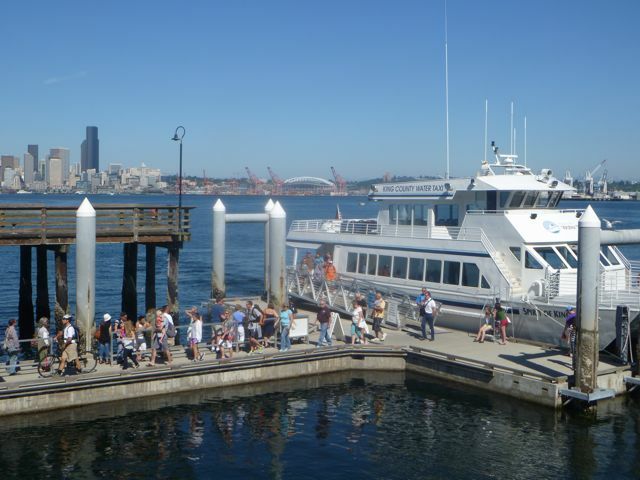 Access the area by car or transit via the West Seattle Bridge, or take your bike on the King County Water Taxi that leaves from the main Seattle waterfront. Extend the ride to the west, by heading south on quiet waterfront streets, and a seaside sharrowed thoroughfare through a residential district. To the east, trails lead on a separated bike path across a bridge that provides fabulous vistas, and an option to follow an on-road route to downtown and the waterfront district. 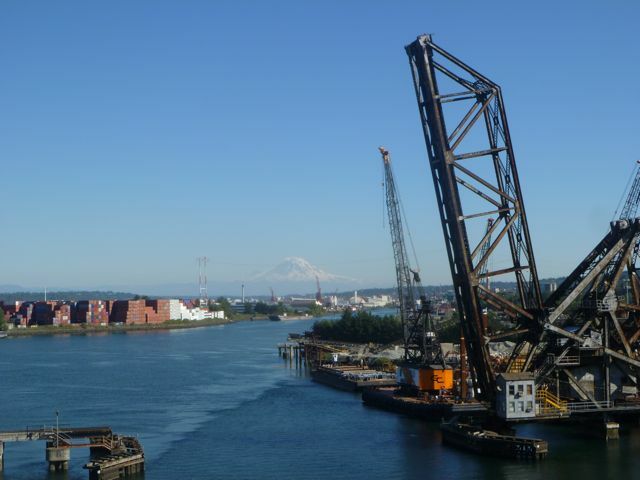 We typically ride halfway across the bridge to take in the view that can include Mt. Rainier. On a sunny day the ride is so spectacular that you will stop frequently for photos. It’s a great way to start or end the day, a fabulous bike and brunch ride, and at up to 15 miles with scenic extensions, a fairly good workout. The water taxi takes you and your bikes between the Alki Trail and the Seattle Waterfront district. 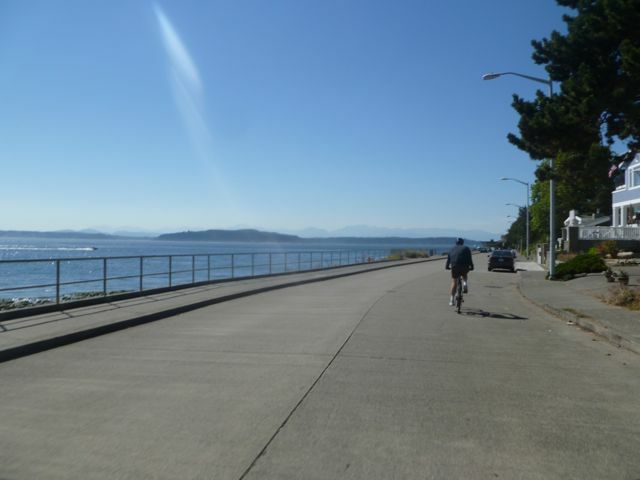 Most of the 3-mile portion of the main Alki Trail is nicely separated for bikes and peds. Washington State Ferry and Space Needle, as seen from Alki Trail. Olympic Mountains beyond Puget Sound, looking west from Alki Trail. 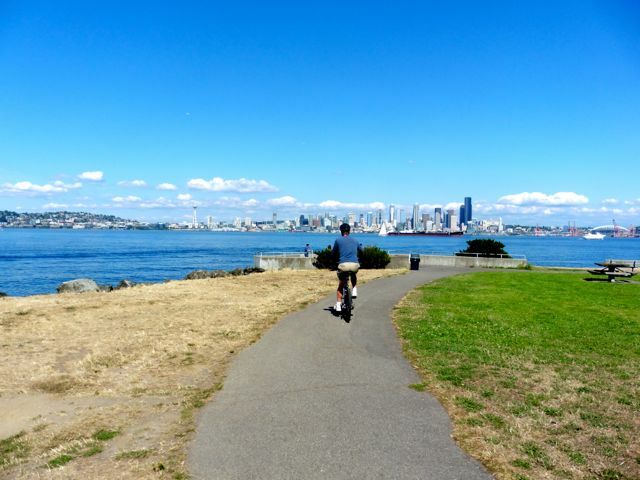 Cycling east on the Alki Trail with Seattle skyline in the distance. Continuing around the peninsula to the west on surface streets. 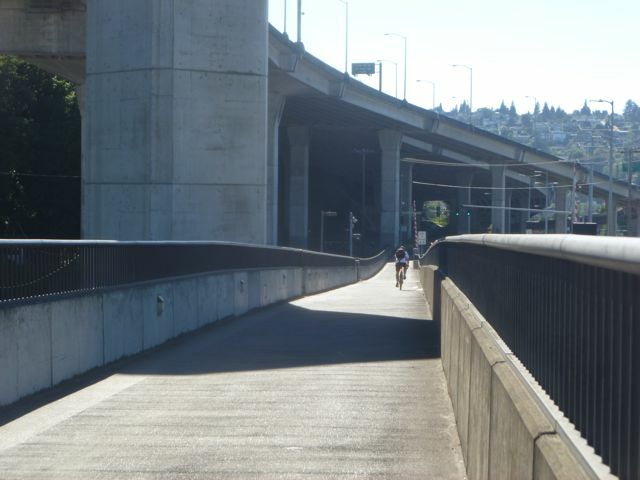 Bike paths continue, here crossing a bridge over Puget Sound. Mt Rainier, seen from the bridge at the south end of the trail. 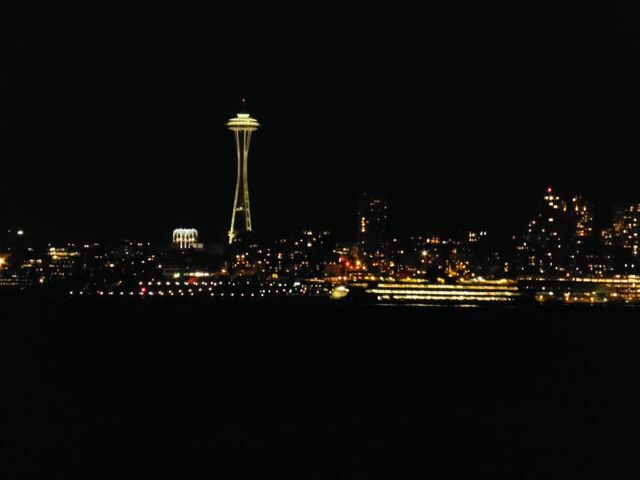 Even at night the Alki Trail enchants. This is a similar scene as the daytime shot of a ferry passing in front of the Space Needle.